ATV riding in Arkansas has to be one of the most breath taking and enjoyable activities in the United States. 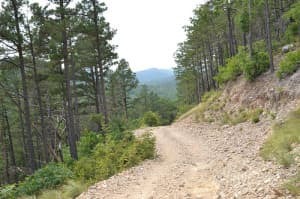 No matter whether your preference for ATV riding is country side or through a National Forest, Arkansas has what you are looking for. Your expectations will be exceeded no matter what route you choose. Arkansas has some very simplistic laws and requirements in place for ATV owners. The first requirement for the state is that all three or four wheel ATV’s are registered to a legal owner. When registered the ATV is then allowed to be titled. Second, the four wheeler must be equipped with headlights. The headlights must be used from thirty minutes after sunset until thirty minutes prior to sunrise. A person must be over twelve years of age, unless they are riding with someone atleast eighteen years old or on a parent’s land. Four wheelers may not be used on public highways or streets. The only exception is if the person is crossing a public road to get to private land. The first recommend ride site is a state park. Bear Creek Cycle Trail-Daisy State Park is an idyllic place to ride because the scenery is phenomenal. The park itself is situated along Lake Greeson. There are panoramic views or the lake and of Ouachita Mountain range. The terrain itself varies from easy to expert riding. There are several areas along the trails to stop and relax. Four Wheelers are not allowed to be used in recreational areas. The next locale is The Ouachita National Forest. The forest has three separate trails for avid riders. Fourche Mountain Trail has adventurous abandoned silver mines, picturesque views of the Fourche Mountain range and beautiful streams. Sugar Creek Trail offers multi looping services for trail riders. This location is used often by avid adventure seekers. Wolf Pen Gap ATV Riding Trail offers thirty five miles of riding that range from easy to expert. The trail runs through creeks and streams to a forest of beautiful pines. Ozark National Forest has four separate sites for trail riding. The first is Brock Creek Trails. Brock Creek has forty two miles of trails. The multi system loops cross over major highways for easy access. Next up is Huckleberry Mountain Trail. This trail offers two loops and over forty miles of access. It is known as one of the most serene and beautiful surroundings. It includes springs, creeks, and mountain views. Mill Creek OHV Trail System is known for it’s crystal clear springs, hardwoods forest and rock formations. Moccasin Gap Trails is used often for the more competitive rider. It contains four loop trails and beautiful scenery. It contains stunning waterfalls, numerous streams and amazing hardwoods.